Huawei is giddy with the relative success of the Ascend G300 and has delivered two more phones in the range. The G330 is the first up, and comes with a 4-inch WVGA screen, dual-core 1GHz processor and a pretty meaty 512MB of RAM. There's 4GB of internal memory, a 5MP camera bolted on the back and it's got a fairly run of the mill 1500mAh battery on board. It is running Android Ice Cream Sandwich though, and will cost just €199 (around £155 / $250) on a SIM free basis. However, it's overshadowed by the more impressively-endowed Huawei Ascend G600, which offers up DTS sound, a 4.5-inch qHD resolution screen, Gorilla Glass front and a dual-core 1.2GHz chip at its heart. Also running Ice Cream Sandwich, the phone will be the first from Huawei to pack in NFC as standard as well, which is something the Chinese brand thinks will help it in the enterprise sector. It's got a 2000mAh battery, an 8MP camera on the back and apparently takes the 'Honor story to the next level'… which is good, seeing as the Huawei Honour phone really didn't take us very far at all. It's coming in at a palatable €299 on a SIM free basis (around £235 / $370) although carriers are being lined up for this one. 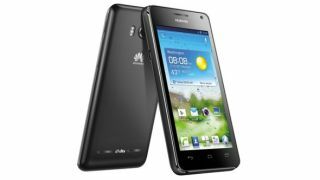 Both the Huawei Ascend G330 and the Huawei Ascend G600 release dates have been set for October, so it's not long to wait to get your hands on some mid-range, but slightly cheaper, devices. Update: It's been pointed out that the Ascend Y201, Ascend G300 and Sonic U8650 also have NFC chips in, but these are optional extras for carriers. Thanks Joao for the spot!